Foresight Intelligence telematics devices can now receive driver behavior insights for free. The optional add-on will be complimentary for all new and existing customers who use Foresight Intelligence telematics devices for on-road vehicles. Driver behavior insight can include hard braking or acceleration, impact detection, speeding, and other dangerous maneuvers. Whether or not each type of event is available to the fleet manager depends on the vehicle and the telematics device installed on the vehicle. Fleet Intelligence™ is a mixed fleet software solution that interprets data from telematics devices as well as from other sources. Fleet managers of off-road and on-road vehicles can view their entire fleet, regardless of the brand, in one place. The data is live and presented in a user-friendly way for equipment managers. Foresight Intelligence currently offers five different telematics devices with the driver behavior option. The devices are optimized for various types of equipment, including light duty vehicles, semi-trucks, and heavy equipment. All the devices also transmit standard data which includes location and engine hours or mileage. Some devices transmit engine related data as well. Most devices transmit data once every two minutes by default which allows managers to make decisions in real time and shorter transmission intervals can be set. Market value for driver behavior data with a one-year commitment is between $200 – $300 per vehicle. View the accompanying article on Construction Equipment. Foresight Intelligence, Inc. is a data analytics software company that focuses on collecting data and providing pertinent information for smart actions. 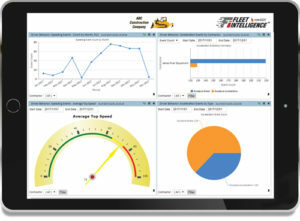 Fleet Intelligence was designed to meet the need for a mixed fleet solution that provides intuitive insights into heavy equipment fleets. Discover more about Fleet Intelligence at https://foresightintelligence.com/fleetintelligence/.